Last summer’s prolonged heatwave put water companies under immense pressure to maintain supplies, with increased consumption exacerbating the challenges of reduced capacity on the network. The problems were particularly acute in East Anglia, where the temperatures reached record highs for record periods and farmers were forced to water their crops to protect yields. To address these severe conditions, Essex and Suffolk adopted a strategy of supplementing the existing infrastructure by recommissioning disused assets in order to put more water into the supply chain. 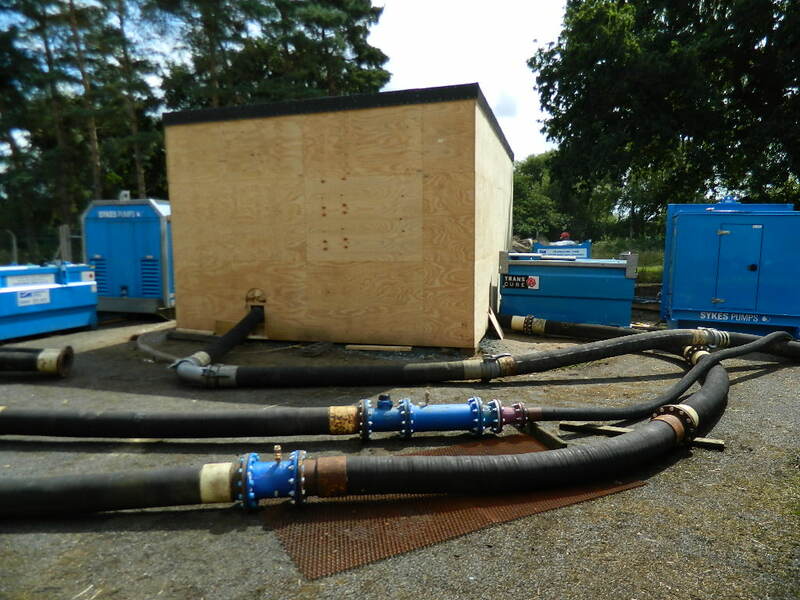 For the rural Norfolk villages north of Norwich, this meant re-activating a disused pumping station in the village of Horning and Sykes Pumps was brought in to provide a temporary pumping solution that would enable the use of an asset that had been out of service for 40 years. The nearby pumping station at Belaugh provides the local area with 27 mega litres of water per day to Ormesby WTW, supported by abstraction from the Trinity Broads to meet the needs of local households, businesses and farms. However, reduced rainfall and operational constraints meant that this capacity was compromised and Essex & Suffolk Water secured permission from the Environment Agency to resume abstraction from the area’s main natural water source, the River Bure at Horning. To do this, the water company needed to re-activate the disused pumping station at Horning but, after 40 years of inactivity, the existing pumps could not be used due to their age and state of repair. To work around this, Essex & Suffolk Water’s contractor, Integrated Water Services, contacted Sykes Pumps to discuss a pumping solution that could abstract the 2-3 mega litres of water they estimated would be required to supplement the supply from Belaugh. The solution would need to use the existing pumping station to put the additional volume into the treatment works while overcoming the need to reactivate the existing pumps. To ensure that the temporary pumping installation met Essex and Suffolk Water’s requirements, the Sykes Pumps team visited the site to carry out a full specification could be drawn up. Explains Sykes Pumps hire manager, Rob Richards: “The customer wanted a robust solution that would allow them to increase capacity quickly if the situation escalated. Our response was to provide two duty pumps and a standby, along with two accessories needed to connect the temporary pumps with the existing infrastructure, adapting the fittings where required to align to the temporary pumps to existing connections. While the duty pump was a 6″ unit, Sykes Pumps adapted the set-up to use 8″ hoses so that everything on site was standardised. The pumps were connected using 200mm wire armoured Bauer suction hoses to abstract the water and 200mm high pressure flanged discharge hoses to feed the abstracted supply to the network. Rob Richards explains: “Three suction hoses per pump were designed to pump the water out of the pumping station chamber supplied by the river and a 23m flanged high pressure hose connected the pumps to the nearest point on the raw water main to Ormesby WTW. 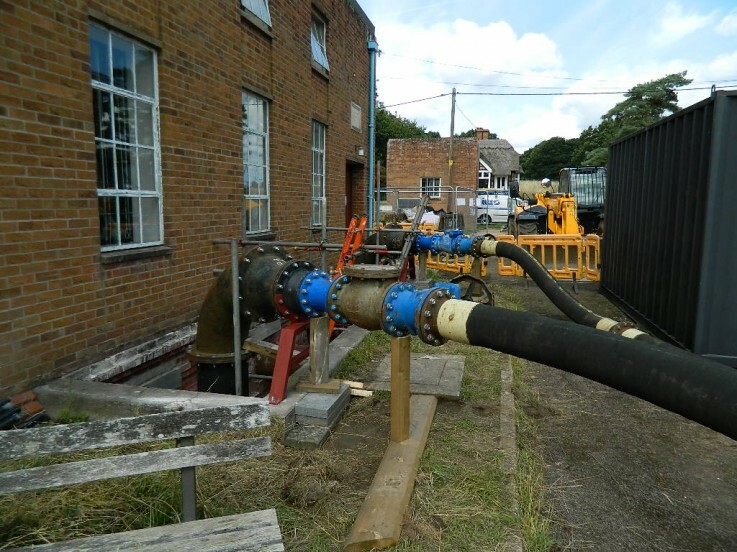 The temporary pumping solution was installed by Integrated Water Services with the support and advice of the Sykes Pumps team who assisted with connecting the pumps up. While all three pumps remained on site into September wehen the heatwave had passed, only the UVO 150/100E 6″ diesel pump was actually required to boost the water supply throughout the summer months. This article was posted in Andrews Sykes Group Plc, News, Pump Hire and tagged Pump Hire, Sykes Pumps. Both comments and trackbacks are closed.